Glenavon kicked off the Danske Bank Premiership season in style as a slick second-half performance left the Mourneview Park men on a commanding 4-0 scoreline against spirited Carrick Rangers. 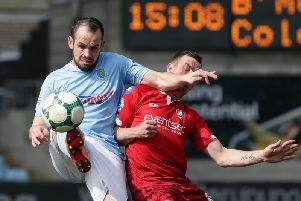 Carrick posed an early threat when Brian McCaul’s flick was collected on the run by Tiarnan McNicholl, who attacked the penalty area but failed to release a shot. David Elebert provided the starting point for a number of attacks and one forward pass released Joel Cooper along the left, with the livewire forward cutting inside and forcing Brian Neeson into a smart save down to his right to push away a shot destined to nestle inside the post. Paddy McCourt’s Irish League debut as Glenavon captain featured sporadic encouraging examples of his passing range and vision but the former Northern Ireland international limped off late in the first half. The match marked a Mourneview Park appearance for another summer signing in Guy Bates, with the former Glenavon forward back in Lurgan blue and leading the attack. Bates’ strength at the head of the frontline resulted in an opening just before the half-hour mark as he guided a ball into the path of the driving Cooper, with the resultant shot lacking the power to test Neeson. Carrick worked hard to frustrate the home side’s space but also increased in confidence and entered half-time having created the best chance before the break when former Glenavon playmaker McCaul fired over the bar from an unmarked position in the middle of the penalty area. Everything changed around four minutes into the second half as Rhys Marshall waltzed clear of the Carrick defence and took advantage of the space to steer home a casual shot from distance which Neeson could only watch find the top corner. Glenavon pushed to increase the advantage and Cooper caused problems for Carrick from the right with an initial corner-kick then a cross that led to, respectively, attempts by Elebert and Declan O’Brien. Neeson’s acrobatics left Cooper frustrated again with another save to his right to stop the Glenavon man’s sidefoot shot after a Mark Sykes cross was flicked towards the far post by Bates. Carrick substitute Miguel Chines won a corner then delivered a ball which Nathan Hanley headed over from a promising position. It was 2-0 within moments as Bates fed Cooper on the left and he capped his afternoon with a spot on the scoresheet by smashing home a low shot from the left. Glenavon’s command of the second half increased soon after following another impressive move that ended with substitute Andy Hall whipping over a cross which Marshall guided in with an angled diving header. The final talking point came on 87 minutes as left-back Mark Patton found time and space inside the box and slotted in with a composed finish. GLENAVON: Jonny Tuffey, Simon Kelly, Andy Kilmartin, Rhys Marshall, Joel Cooper, Mark Patton, Mark Sykes, Declan O’Brien, Paddy McCourt, David Elebert, Guy Bates. Subs: Gary Hamilton (on for O’Brien, 70 mins), Kris Lindsay (on for Kelly, 17 mins), Andy Hall (on for McCourt, 43 mins), Andy McGrory, Ciaran Martyn. CARRICK RANGERS: Brian Neeson, Gareth McKeown, Patrick McNally, Stephen McCullough, Thomas James Murphy, Mark Clarke, Seanna Foster, Tiarnan McNicholl, Brian McCaul, Nathan Hanley, Gary Lavery. Subs: Elliott English (on for McCullough, 83 mins), Chris Morrow (on for Clarke, 75 mins), Fra Rice, Glenn Taggart, Miguel Chines (on for McCaul, 63 mins).